John Joseph Enneking (1841 – 1916) was an American Impressionist painter. Enneking is a plein air painter, and his favorite subject is the November twilight of New England, and more generally the half lights of early spring, late autumn, and winter dawn and evening. He was a member of the Twentieth Century Club, Pudding Stone Club, Hyde Park Historical Society, Boston Art Club, Paint and Clay Club of Boston, and the Boston Guild of Artists. He exhibited at the following: Massachusetts Charitable Mechanics Association, Boston (medals); Paris Expo, 1900 (prize); Pan-Am Expo in Buffalo, 1901 (medal); Pan-Pacific Expo in San Francisco, 1915 (gold). 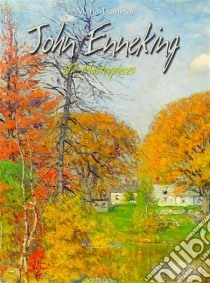 Enneking made several painting trips to the White Mountains and became the artist-in-residence at Wilson Cottages and later in the Iron Mountain House. His work has been preserved at the Worcester Museum and the Boston Museum of Fine Arts.